Arnold Schwarzenegger may have been born in Austria, but he certainly loves the American way of life. 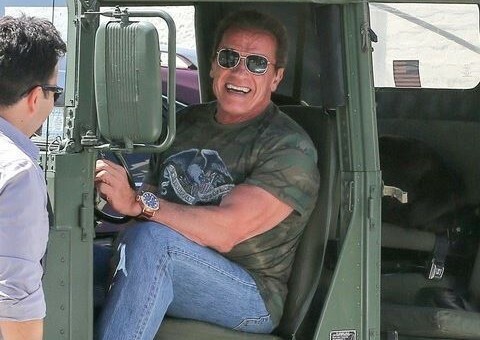 Seen adorning cowboy boots and a bald eagle crested t-shirt, the two-time California governor and action movie star was spotted in Beverly Hills sporting his military spec Hummer. While in office, Schwarzenegger liked to be known as a “green” governor (no, really), and also signed into law the US’ first cap on greenhouse gases. Apparently this stems to his personal life because this particular army-spec Hummer has been modified to run on vegetable oil. Arnold is known as quite the auto enthusiast around the area occasionally making appearances in his grey Bugatti Veyron as well, but locals always love when the green machine comes out for a spin. He gave up six of his seven Hummers in 2006 in an effort to reduce his own carbon footprint.